After some 500 demonstrators gathered in Bishkek’s Ala-Too Square on 17 January 2019 to protest China’s persecution of Muslim Uyghurs in Xianjiang/East Turkestan, a woman has been arrested and charged with inciting ethnic hatred. President Sooronbai Jeenbekov has threatened to prosecute anyone trying to interfere in the Kyrgyz-Chinese partnership. The United Nations has reported that an estimated one million Uyghurs are being held in the so called ‘re-education camps’. A woman in Kyrgyzstan has been arrested and charged with inciting ethnic hatred during a protest against Beijing's policies in the northwestern Chinese region of Xinjiang. A court in Kyrgyzstan’s capital ordered Guljamila Saparalieva to be held in pretrial detention for two months, activist Amanbol Babakulov told RFE/RL on 29 January . The Interfax news agency quoted the Bishkek police as saying that the Birinchi Mai district court ordered that Saparalieva be remanded in custody due to the "gravity" of the accusation and the "social danger" that the accused represents. The investigation into the case was continuing, they also said. Babakulov said the 56-year-old Saparalieva was detained on 23 January . She was among some 500 demonstrators who gathered on Bishkek’s Ala-Too Square on 17 January  to protest against what they called the persecution of Muslims in Xinjiang. The protesters also urged authorities to deport what they said were hundreds of thousands of Chinese migrants living illegally in Kyrgyzstan. The Interior Ministry later said that 21 of the protesters were found guilty of disrupting public order next day and fined 3,000 soms ($45) each. Following similar protests in Bishkek in recent months, President Sooronbai Jeenbekov on 11 January  warned that "those trying to disrupt the Kyrgyz-Chinese partnership" will face legal prosecution. The United Nations said in August that an estimated 1 million Muslims from indigenous ethnic communities in Xinjiang were being held in "counterextremism centers." Uyghurs are the largest indigenous community in Xinjiang, followed by Kazakhs. 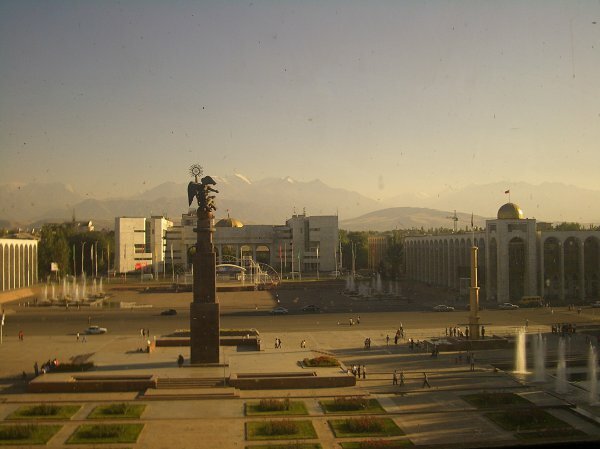 The region is home as well to ethnic Kyrgyz, Tajiks, and Hui, also known as Dungans.